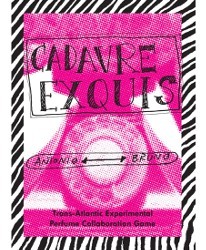 Indie perfumers Bruno Fazzolari and Antonio Gardoni (Bogue Profumo) will launch Cadavre Exquis, a new limited edition fragrance, this weekend at the AIX Scent Fair in Los Angeles. Cadavre Exquis is a monstrous new perfume with two noses: Antonio Gardoni (Bogue Profumo) and Bruno Fazzolari. The two perfumers collaborated by mail for over a year to produce a fragrance in the spirit of the surrealist game of the same name, wherein each artist adds to a drawing folded in such a way that they can't see each other's work. The perfume will be available in a limited edition of 99 bottles of 50 mL, eau de parfum with an accompanying booklet exclusively from LuckyScent and Bruno Fazzolari's website. It will launch at the Hammer Museum's AIX Scent Fair. Inspired by the old surrealist game, Antonio Gardoni (Italy) and Bruno Fazzolari (USA) created a collaborative perfume. The only rule: the perfume would be a “gourmand”, a popular, sweet-fragrance trend that has been called “insulting to the perfumer’s craft”. For over a year, Antonio and Bruno swapped messages, samples, formulas, and images. The final perfume was produced and bottled in Bruno’s artisan lab in San Francisco. The resulting “creature” is made of strangely mismatched parts, a smelly Frankenstein, a “monster” that fights against the obvious. Bruno Fazzolari + Bogue Profumo Cadavre Exquis will be available in 50 ml Eau de Parfum; 99 bottles were made. Update ~ Cadavre Exquis is now available at Luckyscent, $245 for 50 ml. Another update ~ the notes include blood orange, camphor, ylang-ylang, tagetes, dried fruit, star anise, chocolate, cypress, benzoin, vanilla and civet. That sounds interesting! Time was when I would order a limited edition like this unsniffed. However, Luckyscent’s No. 8 (the one that smells like pure poo) made me a lot more cautious. I’d try this if it was about ¼ of the cost. I’ll have to stick with a sample. Love the whole concept though, silly or no. I do think it sounds like fun! But yes, expensive fun.